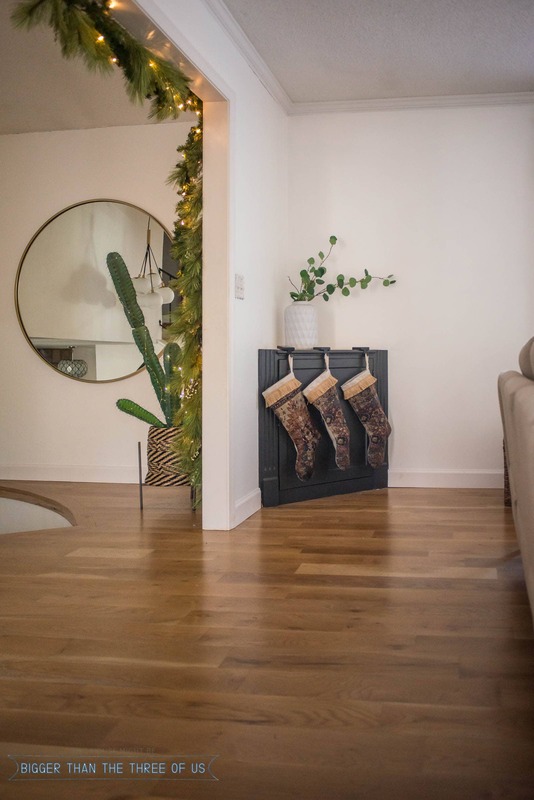 Be inspired by my Minimalist Christmas Decor as well as getting to see more Christmas home tours as part of the Very Merry Christmas Home Tour that is going on this week! Give me a little bit of beautiful greenery and some twinkly lights and I’m a pretty happy camper. Seriously though; for me, Christmas decor is just that… twinkly lights, beautiful swags and maybe a nod to Christmas with a piece of art, or a tabletop tree. I wouldn’t necessarily say that all I do is minimalist decor for Christmas, but really, I don’t know what else to call it. I’m not sure I’m a minimalist but I’m not sure I’m not, so let’s just go with the fact that it feels like me and today, I’m saying it’s my minimalist Christmas home decor. Stay around till the end, because I’m sharing my home along with others. 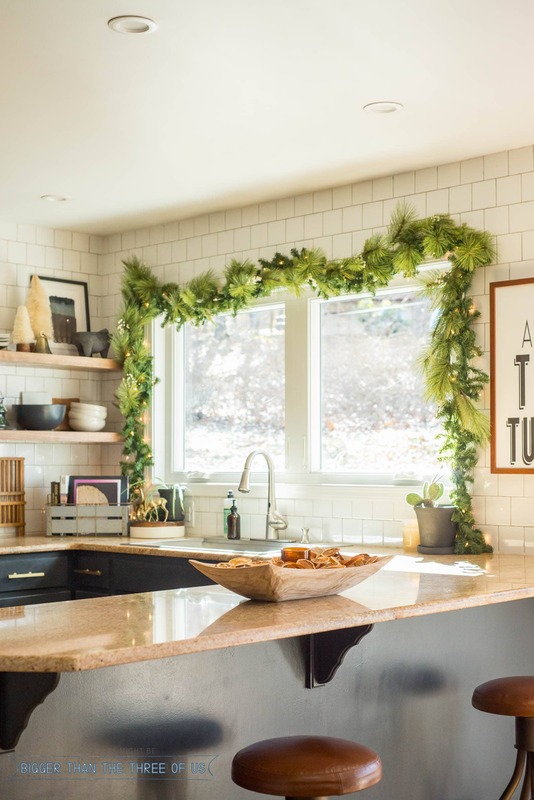 You’ll want to be inspired by everyone else that’s participating in the Very Merry Christmas Home Tour. Also, special thanks to Carrie at Lovely, Etc., for organizing! Like I mentioned, up above, I’m really into simple garland swags and twinkly lights. I added both to our entryway loft area and even some on my cactus. We don’t hang our stockings on a mantle, because we don’t have one in our living room. I’ve been using this built-in corner cabinet to hang our stockings for the past few years and it seems to work pretty well. I probably focus most of my Christmas decorating in the kitchen, just because it’s my favorite place to decorate in the house. 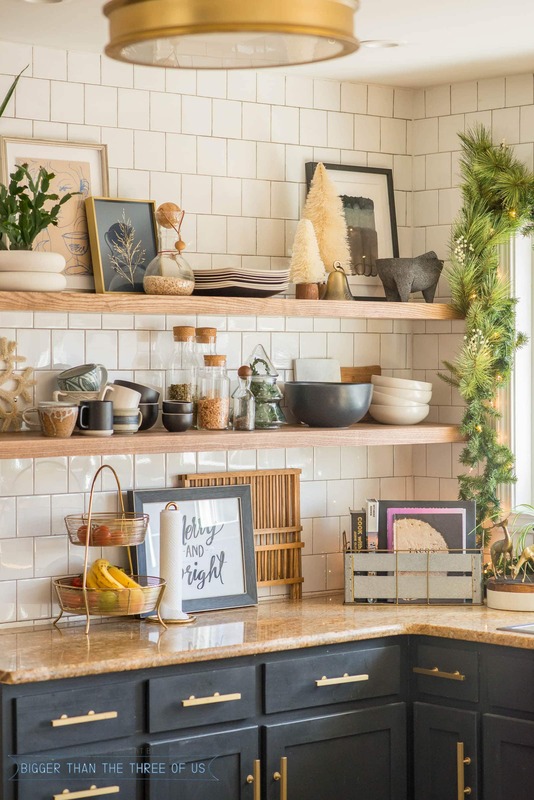 The kitchen shelves are just ideal for mixing new pieces in and adding prints, holiday decor, etc., for a fresh new look. I love the “Merry and Bright” art and it’s a free printable! I printed it out a few years ago and am still enjoying it. I dried oranges to string as garland for my tree this year. I’d never done that before and, I have to say that, it was an easy and fun Christmas DIY. I’m waiting to string them until I dry some grapefruit as well. So, for now, they are sitting in the wooden bowl and that works for me, too! 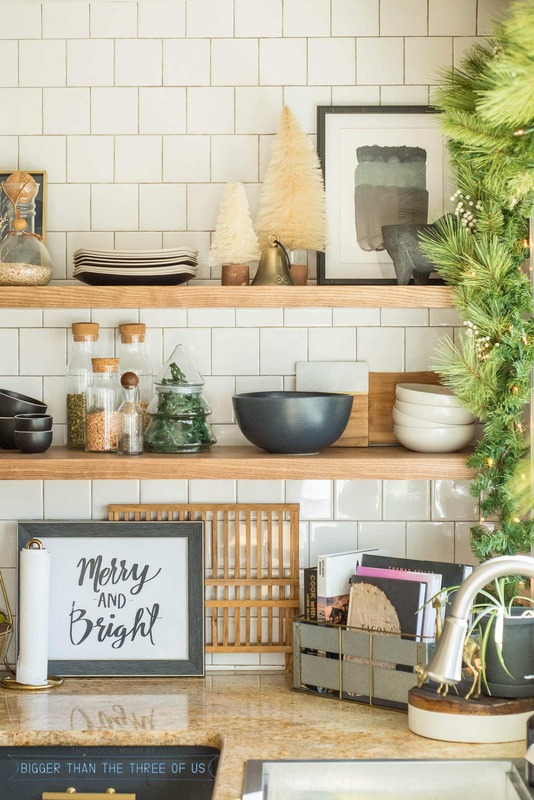 Overall, the goal of decorating the open shelving in the kitchen for Christmas is for them to be festive yet still usable. Our daily cups, bowls and plates have to go on our kitchen shelves but, other than that, it’s fair game for what else goes up there. See last year’s Christmas Open Shelves if you want to see a whole different look. It’s always interesting to see if I do things the same or different! 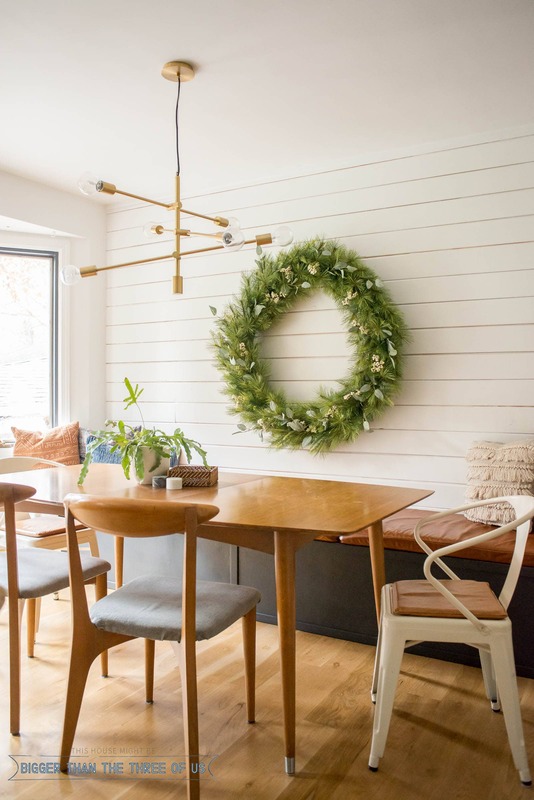 The last little spot that I want to share today is our dining nook. This is where we eat everyday, do homework, puzzles, etc. I splurged on a HUGE wreath and that’s all I put in this space. I have to say that it totally feels like me and makes me smile every time I go by. If you are looking for sources for anything in these rooms (other than Christmas decor), then you’ll want to check out my Shop My Home page. I know you’ll want to check out everyone else in the tour. 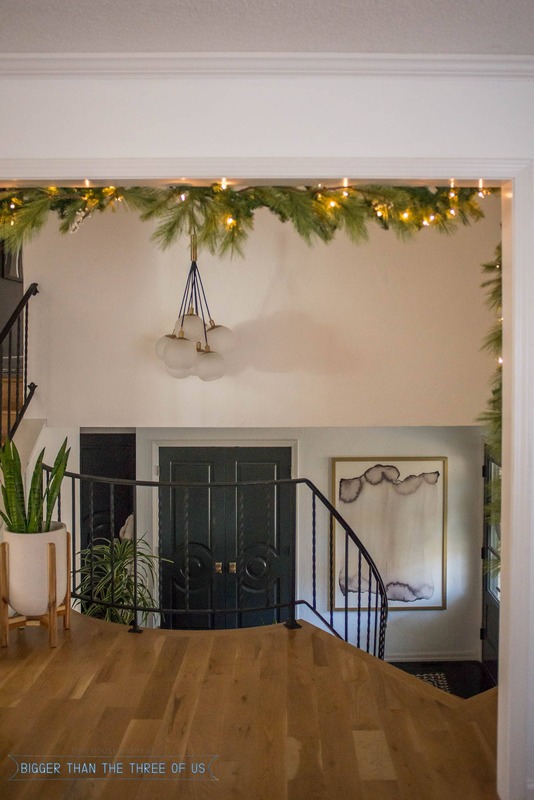 You can follow the Christmas Home Tour loop today by heading over to the Boxy Colonial next. 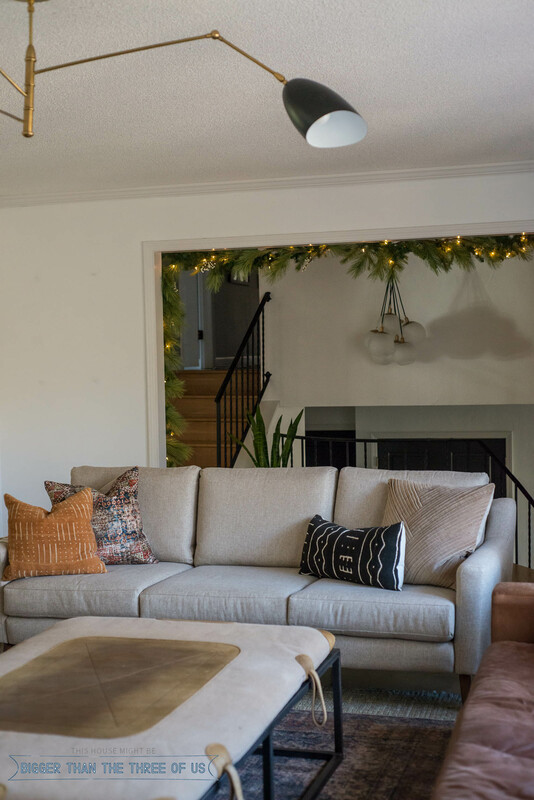 You can follow along with everyone else below and make sure to check back because more Christmas Home Tours will be added each day this week!